Yes, Mumbai is crowded and noisy, but I wouldn’t say it’s unbearably so. As a matter of fact, I found it exciting and exhilarating. 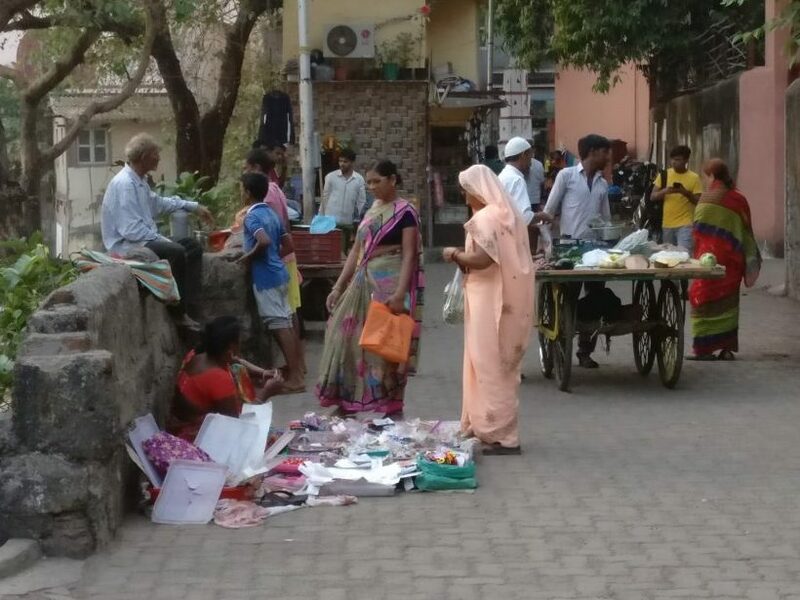 Street scene in Mumbai, near Banganga Tank. As for “Delhi belly,” I was very careful about what I ate, and I was fine. In any case, I didn’t have much free time in Mumbai: only two days. I spent half a day on my trip to Elephanta Island, and a whole day taking a slum tour and a general tour of the city. 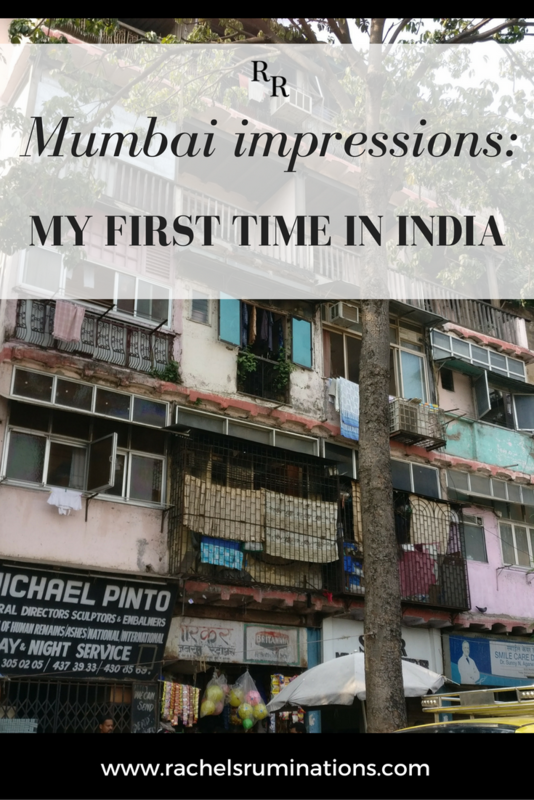 This post, then, is just about my general impressions of Mumbai on my first time in India, or, rather, of the limited area that I saw of an enormous metropolis. And it’s an excuse to show a few more photos. On the day I arrived, I had a few hours free before my first meeting, but I was exhausted, so I didn’t venture far from my hotel (the Westin Mumbai Garden City). It was in the northern “suburbs” of the city, which aren’t really suburbs as much as urban sprawl. 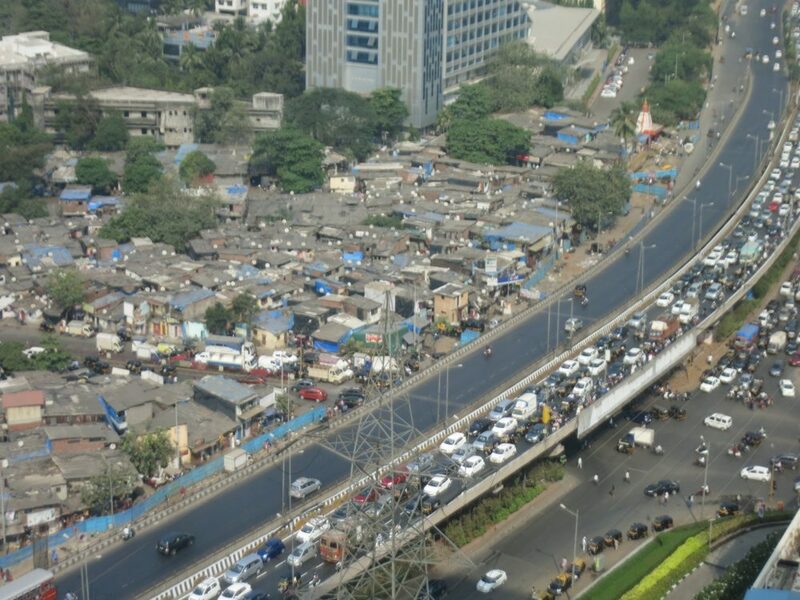 Mumbai has 22 million inhabitants, after all: more than my whole country. I did two things: I crossed the street to explore a small mall, and I took pictures from high up in my hotel. The mall looked like any mall in the US or the Middle East, with some of the standard mall shops like the Gap, Zara, the Body Shop, and Clark’s. Yet I was pleasantly surprised at the number of shops dedicated to traditional Indian clothing with wonderfully bright colors. 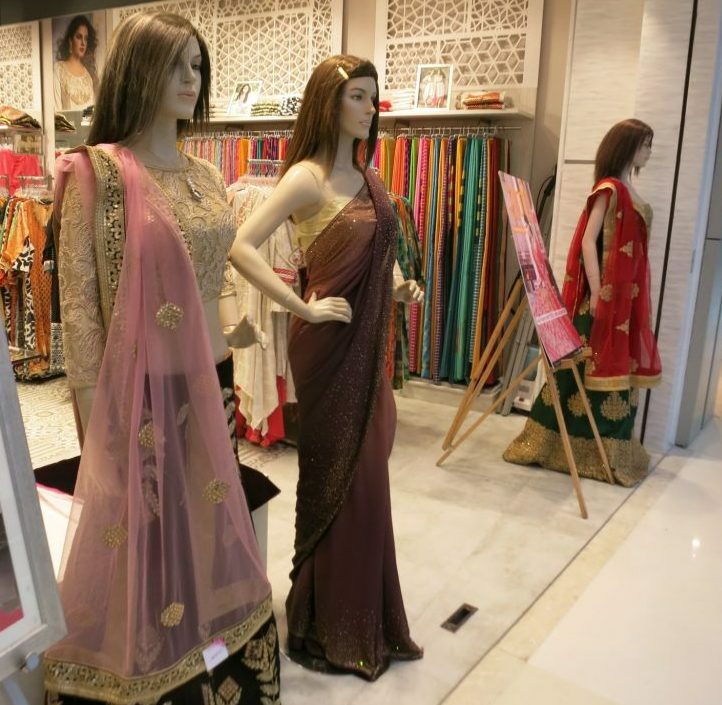 Mannequins in front of a shop in the Oberoi Mall in Mumbai. The Westin Mumbai is a five-star hotel, booked for me by the organizers of the conference where I led a workshop. Looking down from my hotel room on the 25th floor, and then again later from the breakfast buffet and restaurant on the 18th floor, I could see a major north-south road. Over the next few days, every time I looked down at that view, the highway was backed up with traffic in one direction or the other. 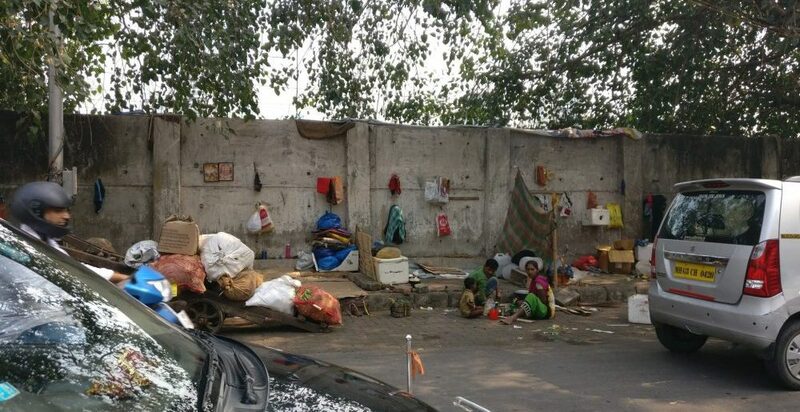 On the other side of the highway we overlooked a large slum. It was quite the contrast: grazing on the extensive breakfast buffet every morning while we perused a slum. Part of the view from the 18th floor at breakfast. Here you can see some of the slum and some of the highway, with inbound morning traffic. I apologize for the poor quality; my compact camera doesn’t zoom well. I longed to go downstairs, cross the highway and explore the slum from closer up, getting pictures of what looked like makeshift homes. Even from so high up, I could see how small the houses were, but how many of them looked pretty solid, with walls of brick or concrete, metal roofs, satellite dishes. They looked like row houses that had been squished together. The traffic was, as I had imagined, chaotic, gridlocked, and very loud. During the workshops, I pretty much only saw the very short distance between the hotel and the school where the conference was taking place. I did get a chance to walk between the two a couple of times. I was struck by the sheer number of vehicles on the road, and how constant the honking. Much of the noise comes from the “rickshaws,” small three-wheeled taxis that use a motorcycle engine, from the sound of it. I filmed this short clip on a corner very near my hotel. The side street I was standing next to meets the main north-south highway here. It will give you just a little taste of the general noise and chaos of the traffic. While many of the roads have lanes painted on to them, the lanes seem to be treated more as a suggestion than a rule, and the rickshaws, being narrower than regular cars, take the most liberties. On the whole, though, drivers seem to respect the rules, obeying traffic lights and traffic cops. 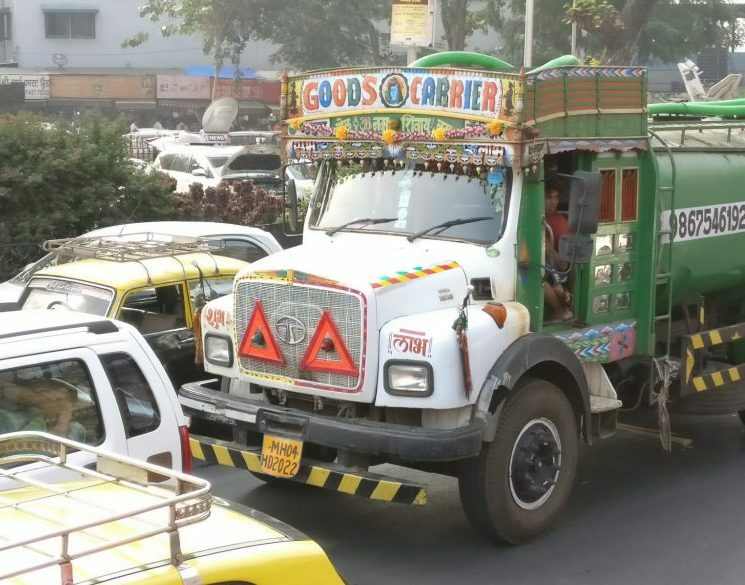 At the same time, the traffic is so heavy that getting into the old center of Mumbai from our hotel – about 32 kilometers – could take anywhere from an hour to two hours. That left me plenty of time to watch the street scenes go by. I already wrote about touring the largest slum in India, Dharavi. Everywhere we drove, we passed similar areas. The buildings are makeshift, and the ones along the roads often include a small shop on the ground floor. Many the more established buildings – apartment blocks, for example – look like they’ve seen better days. A block of flats somewhere in Mumbai, photographed out a car window. 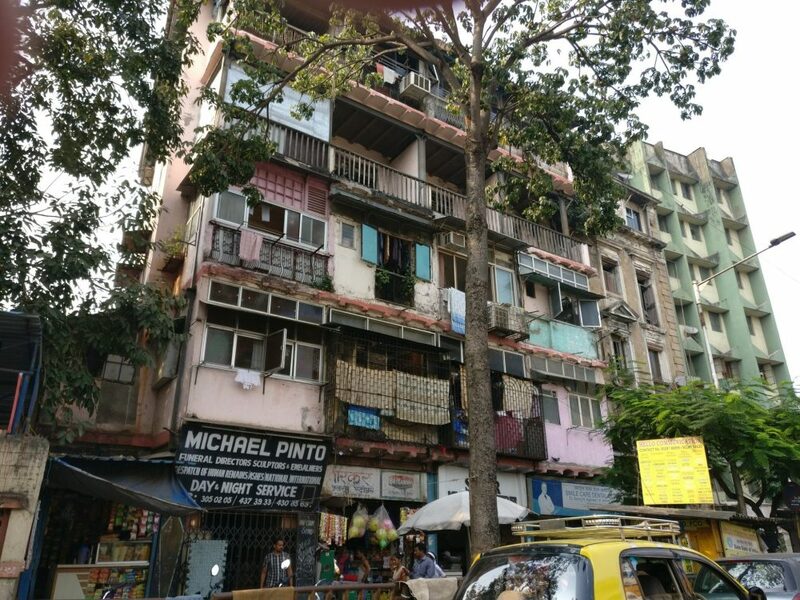 On the other hand, I saw evidence of extreme wealth in Mumbai as well. When I saw that a wedding was taking place at our hotel, I asked an employee how many guests were expected. “About 1500,” he replied. A wedding at a 5-star hotel, including a full meal and presumably drinks, for 1500 people? That must cost an absolute fortune! 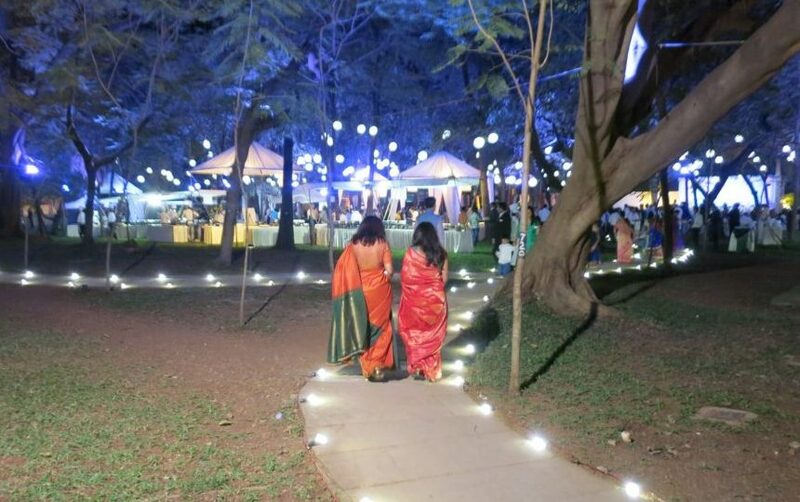 Women in colorful saris walk toward a wedding reception in the garden of our hotel. Mumbai is colorful. Many women wear brightly-patterned saris or dhotis. Homes are vividly-painted. Even trucks are decorated colorfully. I love this. On the other hand, Mumbai is terribly polluted. When I was there, the air had reached dangerous pollution levels. The news was reporting that in New Delhi, just breathing every day was the equivalent of smoking four packs of cigarettes. Mumbai, since it is on the sea, was somewhat better, but still bad. The haze obscured the sky to such an extent that most of the time it looked cloudy, even though it wasn’t. At the same time, the litter is completely out of hand. People seem to just drop wrappers and bottles whenever and wherever they want – I saw this happen on several occasions. Only near the most upscale establishments like the Taj Hotel did I see anyone sweeping the sidewalk. Such pollution, along with the overloaded public sanitation system, means that the beaches are filthy too: strewn with trash, the water too dirty for anyone to even wade. Given all the warnings I’d heard, I was vigilant about what I ate or drank: only bottled water, even for brushing my teeth. I even kept my mouth firmly shut in the shower. I didn’t buy any street food, or, rather, I only bought items that had been factory-packaged, such as crackers or mints. For my meals, I only ate in restaurants that catered to tourists. Perhaps this meant that I didn’t taste the most authentic Indian food, but nevertheless it was wonderful. I was amazed at how different the food I ate in Mumbai was from Indian restaurant food at home. My favorite item was brewed-from-scratch Masala chai: it was absolutely delicious. So these are my general impressions of Mumbai. Contrary to what many people seemed to expect, the chaos did not put me off India. It was the appetizer that succeeded in whetting my appetite: I can’t wait to visit India again, and next time will be a longer visit covering much more of the country. Have you been to Mumbai? What were your impressions when you first visited? Please comment below. And, as ever, I greatly appreciate social media shares! I love that you found India to be interesting and a place you would go back to. India is high on our list and people seem to either love it (colorful, fascinating) or hate (dirty, crowded) it without much in between. The next time probably will be more miraculous and more thought provoking. Yes, I’m sure you’re right. I’m definitely going back! Very similar to my first experience of India Rachel, I could relate a lot to your experiences. The food is definitely worth being more adventurous with in future. I travelled up north to Punjab and drank local ‘lassi’ it was life changing I’m still craving it! I’ve had Lassi in Indian restaurants but didn’t have any in Mumbai. Next time! Great article on Mumbai and one that we will bookmark for future reference. We are still to do Mumbai only having done Kerala and Goa. I suspect that they are easy compared to Mumbai. We will consider doing a tour as well.